Late last year I was approached by TP Norton badminton club to deliver two lots of four weeks coaching after having meet Linzi through ForzaWM. The sessions were booked for June/July of this year and the plan was to work on doubles, rotation and positioning. The start dates was checked and off we jolly well went. The level of players varied with some having very defined shot definition, others needing a little assistance but, listen they did, keen to learn certainly, willing to try and keep trying they were, which is more that a coach can wish for in their pupils. So eight weeks later and the last session delivered earlier this week. What a surprise when at the end of the session when I was presented with a fabulous bouquet of flowers and a box of chocolates for coaching. 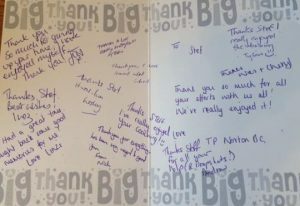 Along with a thank you card signed by all the participant from the sessions. One pupil wrote an email prior to the last session thank you Tyson. (See HERE for his comments). 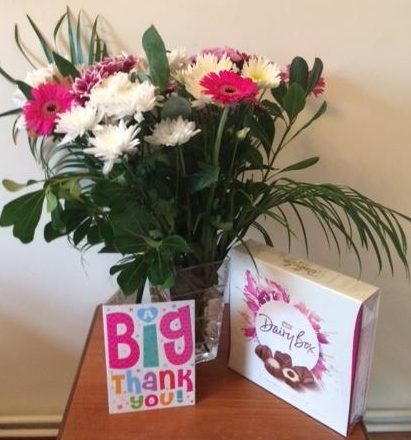 Makes my job even more rewarding when you receive flowers and chocolates for coaching from a group of pupils who appreciate your help and advise. 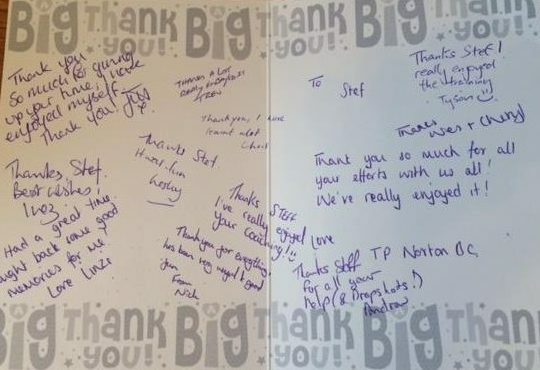 Thank you TP Norton Badminton Club wishing you every success in the coming season. This entry was posted in Badminton News, Badminton Session and tagged Badminton Birmingham, Badminton Coach, Badminton Coaching, Badminton sessions, doubles badminton coaching, TP Norton Badminton Club. Bookmark the permalink.